We consider the following books and tools as useful in business mentoring & business coaching and to our clients being mentored. 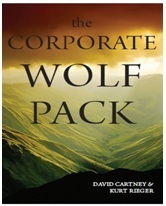 Corporate Wolf Pack is aimed at all business and other organization leaders struggling to come to terms with the realities of vigorous competition and needing to develop their corporate cultures to survive and perform. The book tells a simple story which is used on an executive retreat to train and develop the leaders of tomorrow. Questions and answers are used at the end of each chapter to stimulate discussion on each topic, such as how should leaders behave, who should be the leaders. It uses a story based around the struggles of a wolf pack to encourage leaders and aspiring leaders to think, feel and consider how to build enduring and successful organizations that can compete and survive and build a better future for all of society. Insight Software As CEOs, Directors or General Management you need to get a fast understanding of the financial numbers. Insight is a fast, one page analysis of your profit and loss, balance sheet, and cash flow, to assist you to monitor financial progress and to develop your strategy. Make changes & see the financial impact instantly to profit, cashflow & returns. Strategic Financial Analysis & Cashflow for Company Directors is designed to give company directors strategic financial skills, which are aimed at improving business performance and assisting them to contribute at the board level. These techniques, if implemented appropriately, facilitate improved financial performance and transparency in relation to the performance of any business. This book provides the company director with a pathway to understanding and developing skills in assessing the business and contributing to the strategic improvement of its overall performance. The areas of expertise covered for the company director are complementary to the expected financial analyses techniques and skills of the corporate accountants inside the company, external advisors or accountants in practice. David Cartney, a well-experienced director and professional business mentor and trainer, authors this book. The Conative Connection is a critically acclaimed bestseller in hardcover. The Conative Connection introduces the rediscovery of “conation”, and the domain of the mind that dictates how we act. Kolbe has developed a simple method to quantify an individual’s approach to action, and she shows how to harness rather than work against innate and highly individual creative instincts. Financial Analysis & Cashflow for Financial Controllers & Corporate Accountants This is designed to give financial controllers and corporate accountants practical financial analysis techniques so that they can improve the financial performance of the business and contribute to decision-making at the senior management level. The financial analysis techniques covered in the book help you to deliver practical outcomes that will be valued by senior management and help raise your profile in the organisation from a commercial perspective. David Cartney, a well-experienced chartered accountant who is a professional business mentor and trainer, authors this book. 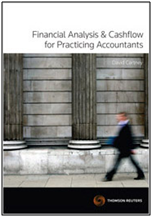 Financial Analysis & Cashflow for Practicing Accountants Designed for accountants in practice across all industries, this book provides practical financial analysis techniques aimed at improving the performance of your business, and that of your clients. The techniques contained in this book will assist you to generate improved financial performance for your clients’ businesses, help cement your relationship with them, and facilitate a higher level of involvement as the client’s business progresses. It provides processes and techniques to assess the financial risk and profile of your practice, develop strategies to ensure continuous performance improvement, improve the financial performance and profitability and generate more fees. David Cartney, a well-experienced chartered accountant who is a professional business mentor and trainer, authors this. Financial Analysis & Cashflow Practice Manual- online The Financial Analysis and Cashflow Practice Manual helps businesses to quickly gain skills and processes for determining financial performance. It also provides practical techniques to improve that performance. Written for both senior management and their advisers across all industries, this Manual provides users with the processes and techniques to assess the financial risk and profile of the business, improve the cashflow position, satisfy stakeholders, and develop strategies to ensure continuous performance improvement and overall success of the organisation. David Cartney, a well-experienced chartered accountant who is a professional business mentor and trainer, authors of this manual. 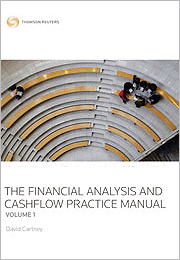 The Financial Analysis & Cashflow Practice Manual is updated twice a year, and is now available online or in a loose-leaf format. The Five Rings for Executives by international management consultant Donald G. Krause, is his third volume on classic battle philosophies that can help today’s business people compete more effectively. Based on an epic five-part letter to students written in 1643 by legendary samurai swordsman Miyamoto Musashi, the book has enthusiastically transplanted long-revered instructions in the martial arts from the Eastern battlefield to the Western boardroom. Musashi’s stirring but difficult original treatise on “achieving competitive dominance” is given a more digestible update here by Krause, who shrewdly reorients its fundamental “five rings” into a set of seven practical principles centered on the requisite modern traits of preparation, discipline, skill, and fluidity. Along the way, he demonstrates how historical leaders such as George Washington and Lawrence of Arabia, in addition to contemporaries like Bill Gates and Howard Schultz, have embraced Musashi’s ideas. The combination ultimately creates, as Krause explains, “a competitive sword which is capable of winning in all phases of business.” –Howard Rothman –This text refers to an out of print or unavailable edition of this title.